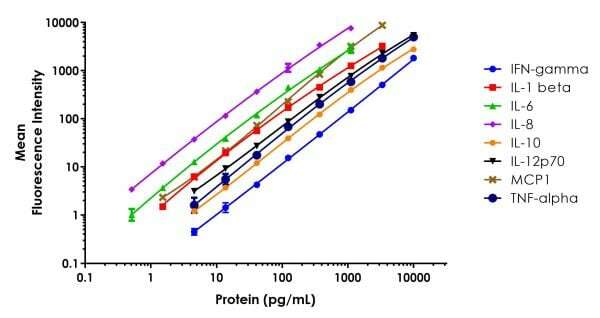 FirePlex Human Inflammation - Immunoassay Panel (ab229793) contains all the reagents you need to run a 8-plex assay: antibody conjugated particles, Human Core Reagents and Protein Standard Mix. NOTE: FirePlex Immunoassay panels require the purchase of a Run Buffer. Use our FirePlex Cytometer Setup Kit V2 (ab245835) to select the most appropriate Run Buffer for your flow cytometer. Assay run-time is 3.5 hours, followed by particle analysis using a validated flow cytometer model and data analysis using our integrated, free-of-charge FirePlex Analysis Workbench software. This panel was previously available under the product code ab231391, which is discontinued. 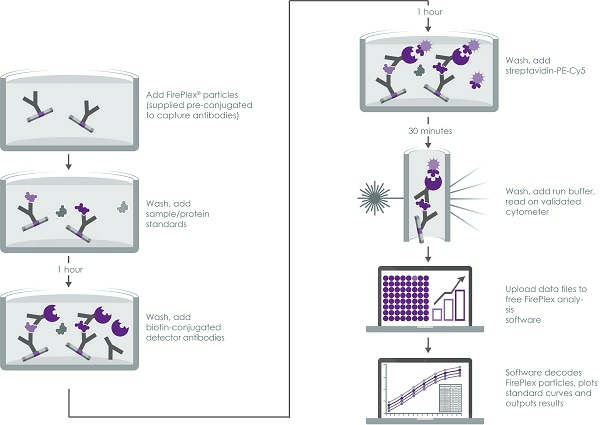 We have redeveloped this panel using new, recombinant monoclonal antibodies that provide higher sensitivity and better reproducibility when quantifying the analytes with biofluid samples, improving consistency in kit performance. The following information provides the sensitivity, range, CVs, and required Protein Standard Mix. IL12: Secreted. TNF alpha: Secreted and Cell membrane. IL8: Secreted. MCP1: Secreted. IL6: Secreted. IL10: Secreted. Interferon gamma: Secreted. IL1 beta: Cytoplasm, cytosol. Lysosome. Secreted, exosome. Cytoplasmic vesicle, autophagosome. Secreted. The precursor is cytosolic. In response to inflammasome-activating signals, such as ATP for NLRP3 inflammasome or bacterial flagellin for NLRC4 inflammasome, cleaved and secreted. IL1B lacks any known signal sequence and the pathway(s) of its secretion is(are) not yet fully understood (PubMed:24201029). On the basis of experimental results, several unconventional secretion mechanisms have been proposed. 1. Secretion via secretory lysosomes: a fraction of CASP1 and IL1B precursor may be incorporated, by a yet undefined mechanism, into secretory lysosomes that undergo Ca(2+)-dependent exocytosis with release of mature IL1B (PubMed:15192144). 2. Secretory autophagy: IL1B-containing autophagosomes may fuse with endosomes or multivesicular bodies (MVBs) and then merge with the plasma membrane releasing soluble IL1B or IL1B-containing exosomes (PubMed:24201029). However, autophagy impacts IL1B production at several levels and its role in secretion is still controversial. 3. Secretion via exosomes: ATP-activation of P2RX7 leads to the formation of MVBs containing exosomes with entrapped IL1B, CASP1 and other inflammasome components. These MVBs undergo exocytosis with the release of exosomes. The release of soluble IL1B occurs after the lysis of exosome membranes (By similarity). 4. Secretion by microvesicle shedding: activation of the ATP receptor P2RX7 may induce an immediate shedding of membrane-derived microvesicles containing IL1B and possibly inflammasome components. The cytokine is then released in the extracellular compartment after microvesicle lysis (PubMed:11728343). 5. Release by translocation through permeabilized plasma membrane. This may occur in cells undergoing pyroptosis due to sustained activation of the inflammasome (By similarity). These mechanisms may not be not mutually exclusive. Mean background-subtracted data values are graphed (+/- SD). ab229793 has not yet been referenced specifically in any publications. Publishing research using ab229793? Please let us know so that we can cite the reference in this datasheet. There are currently no Customer reviews or Questions for ab229793.